Someone somewhere told once that 'Memories are timeless treasures of heart'. It’s so true that things end and life changes but memories last forever. Some memories fade with age but some persists forever. It’s also true that some memories can never be replaced or recreated. Some painful as a sting and some pleasant as a breeze, but memories live forever. End of last year I joined my highschool friends on a WhatsApp group. Since then we were trying our best to connect the missing links of the chain once we were all part of. We were eager to share the pictures and family where about each other. Many of them changed to an extent where you could easily bypass as a stranger even encountered face to face, but some were untouched by time and age! It was an amazing and wonderful feeling to connect the past and walk through our school days. Some were up even at midnight to eagerly share the mischief and jokes they kept as secret for long time. It was hard to catch up on the messages if you miss one day. A bunch of them were lucky enough to arrange a get together in our old class room and spent some time together. They shared with us the old memories which kept our hopes and dreams young. Thanks to all who worked so hard to connect each one around the world and bring them together under one roof of our 10th grade class room. I am sure everyone can relate how nostalgic that feeling could be! On that sweet note of revamping our lost friendship, I would like to share a dessert I made for this summer. I wanted to try something other than a regular vanilla sponge cake as the base, so thought to give the cake some summery citrus punch. The lemon yogurt sponge cake came out to be so flavorful and complimented the pine apple upside down cake. If you are looking for a dessert for a potluck, then try this recipe. You can half the recipe for your family. Melt 4 tbsp of butter and pour it into the baking pan. Sprinkle 4 tbsp of brown sugar on it. Sift the all purpose flour, baking powder and salt and set it aside. In a mixing bowl of stand mixer, combine the eggs and sugar and beat it till creamy. Add the lemon juice, yogurt, vegetable oil, lemon zest and lemon oil and beat for 30 seconds using a paddle attachment. Add the sifted flour mix to the wet ingredients and mix till a smooth batter with no lumps is attained. Arrange the pine apple rings on the baking pan. Place the cherries in the center of each pine apple ring. Slowly pour the batter on the arranged pineapple rings. Bake for 50 to 55 minutes or until a toothpick comes out clean when inserted in the center of the cake. Take the cake out of the oven and let it cool for 15 minutes. Flip the cake on a wire rack to cool completely or on a serving plate if serving warm. Top the piece of cake with some fresh whipped cream and serve. Lemon oil gives a nice citrus flavor to the cake. I got some essential oils from amazon and you can get it here. They are good to use in frosting. I used a pyrex glass container to bake the cake. Depending on the type of baking dish, the cooking time will vary. Make sure to flip the cake while its still warm, otherwise the butter and brown sugar will stick to the bottom of the pan and will not result in a pretty looking cake when you flip it. You can half the recipe to make the cake in a loaf pan. I used 2 small eggs when I made it in a loaf pan. Rest of the ingredients can be halved. We love upside down cakes. 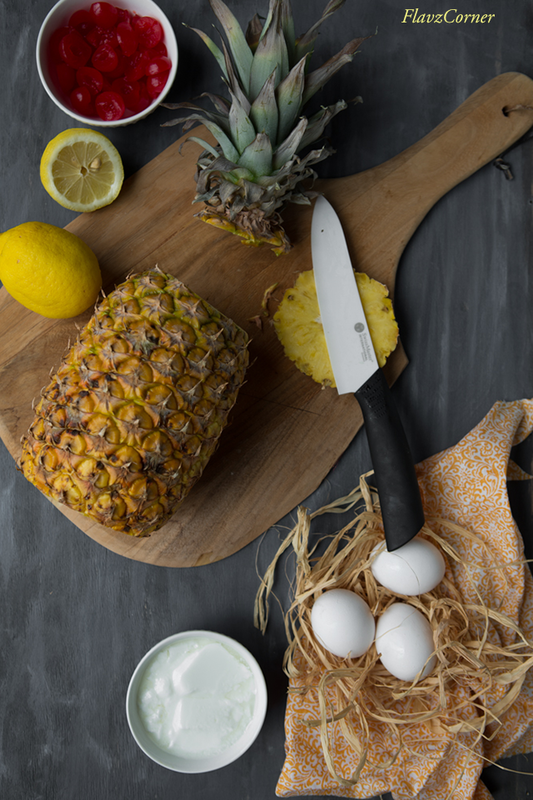 Yours with pineapples looks excellent, Shibi. Always fun to reconnect with old friends, isn't it? And I'd like to connect with this cake! 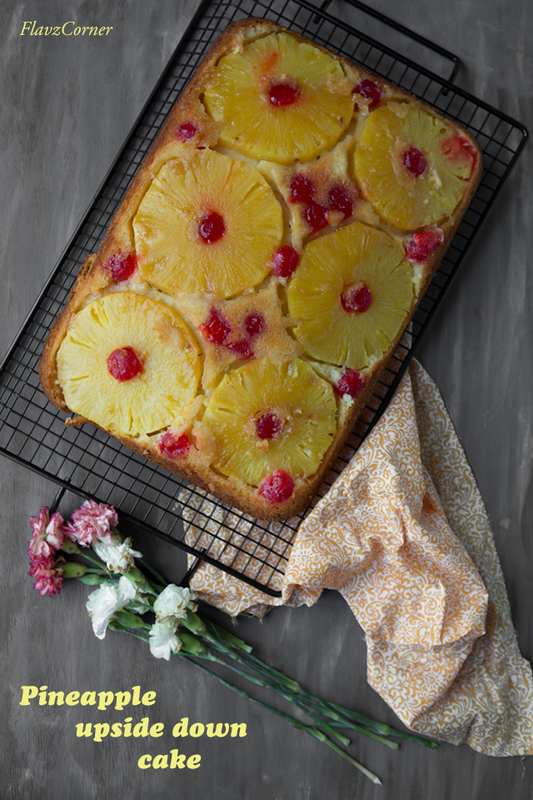 Wow, this looks excellent -- always enjoy an upside down cake, and pineapple is the best, IMO. Good stuff -- thanks! My family loves upside down cakes.. 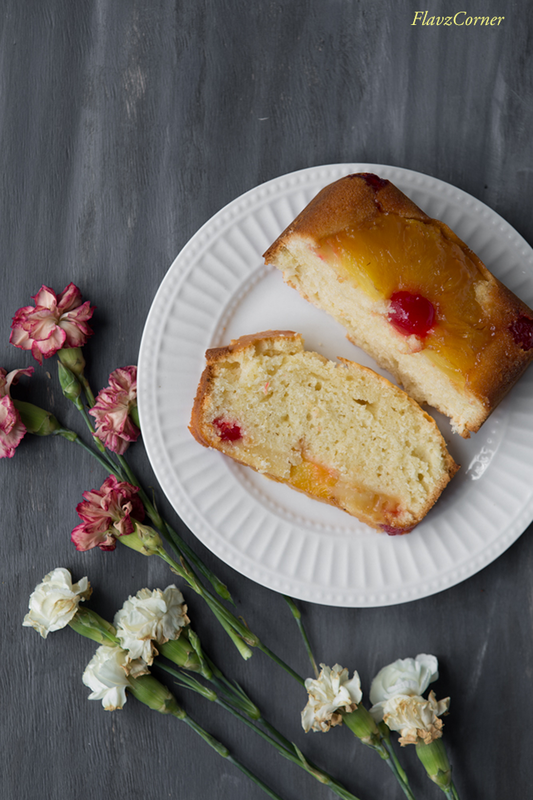 I do make it with peaches and oranges too for myself as I am allergic to pineapple....but still got tempted by the look of your pineapple upside down cake..
what a great combo..looks so flavorful,super delicious loaf esp the pineapple.. 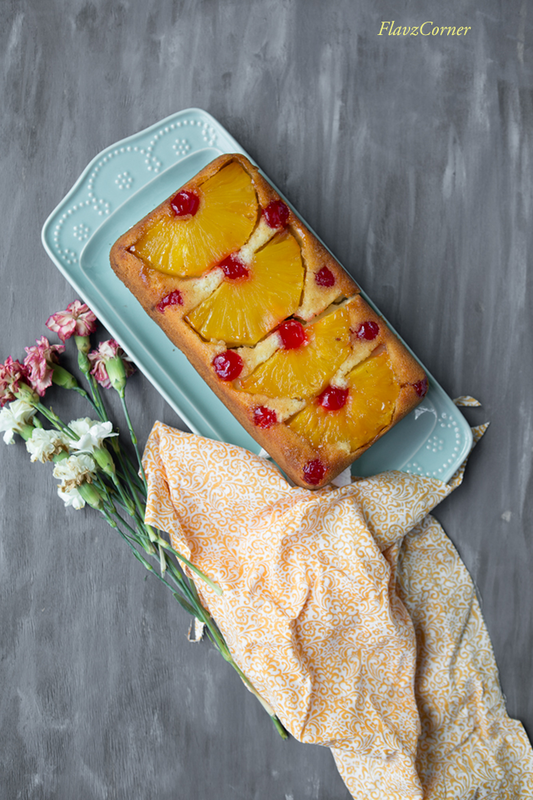 I love pineapple upside down cake but never tried added a citrus touch to it..will try!